In the dim light of a basement apartment, six-year-old Claude Rawlings sits at an old white piano, picking out the sounds he has heard on the radio and shutting out the reality of his lonely world. The setting is 1940s New York, a city that is "long gone, replaced by another city of the same name." Against a backdrop that pulses with sound and rhythm, Body & Soul brilliantly evokes the life of a child prodigy whose musical genius pulls him out of squalor and into the drawing rooms of the rich and a gilt-edged marriage. But the same talent that transforms him also hurtles Claude into a lonely world of obsession and relentless ambition. 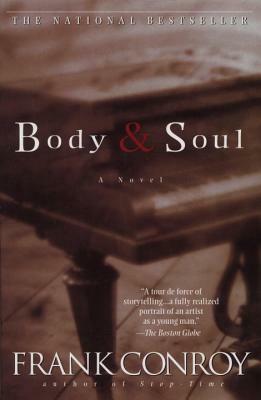 From Carnegie Hall to the smoky jazz clubs of London, Body & Soul burns with passion and truth--at once a riveting, compulsive read and a breathtaking glimpse into a boy's heart and an artist's soul. Frank Conroy was born in 1936 and graduated from Haverford College in 1958. He is currently teaching at the University of Iowa, where he is director of the prestigious Writeer’s Workshop. Conroy has written an autobiography Stop-Time, published in 1967, and his collection of stories, Midair, was published in 1985. His work has appeared in The New Yorker, Esquire, GQ, Harper’s Magazine, and Partisan Review. He divides his time between Iowa City and Nantucket.